The world's view of marriage can often be very different to what the Bible says. But who is right, and who should we listen to? From very young, children are confronted with and can be confused by these conflicts. This hardback, illustrated title helps to explain the beauties of God's plan for marriage to children of any age, introducing them to a different, counter-cultural way of viewing these aspects of life and faith. 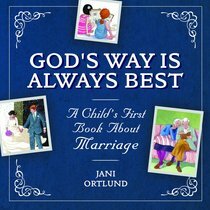 About "God's Way is Always Best: A Child's First Book About Marriage"
Jani Ortlund is a mother, pastor's wife, and former elementary school teacher. She leads Bible studies, speaks at conferences worldwide, and does part-time ministry at First Presbyterian Church of Augusta, Georgia, where her husband, Ray, is senior pastor. She holds a bachelor's degree in elementary education from Wheaton College and a master's degree in education from National Louis University. Jani and Ray have been married for more than twenty-six years, live near Augusta, and are the parents of four children.